Habitat: Bearberry is native to colder northern climates, including North America, Europe, the Iberian Peninsula, Siberia, and the Himalayas. Description: Bearberry is a small groundcover shrub, growing 5 to 30 cm high. Leaves are evergreen and leathery, alternately arranged on the stems. Stems can be red if the plant grows in full sun, and green if it grows in shady areas. Flowering occurs in May. Flowers are borne in drooping clusters, they are urn-shaped and white or pink in color. The fruit is a red berry. Useful Components: Arbutin, gallic, tannic and ursolic acid, essential oils, resin, hydroquinones, phenolic glucosides and flavonoids. 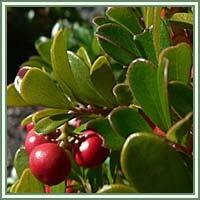 Medicinal use: Bearberry is considered to be an antiseptic, astringent, diuretic, sedative, stimulant and tonic. It has a long history of medicinal use and a wide variety of medicinal applications. It has been used in treatment of arthritis, bladder infections, bronchitis, cystitis, diabetes, gallstones, hemorrhoids, kidney stones and infections, rheumatism, urethritis and vaginal disorders. Bearberry is most commonly recommended in treatment of illnesses caused by Escherichia coli. The plants anti-microbial and diuretic actions are mainly due to its arbutin content. It can be very effective against urinary tract infections and complaints. 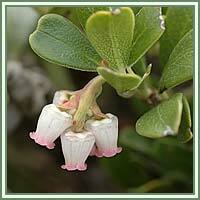 Some studies suggest that Bearberry could also be effective against certain yeast (particularly Candida species). Safety: Some herbs could interact with certain medication. Therefore it is advisable to contact your doctor/herbalist before consumption of any herb.